Police officers investigated in the area of Gerard Street for several hours after the shootings occurred Friday. In the dead of night, a thundering crash shook George Street in Roxbury early Friday, jolting residents from sleep and sending them running outside to see what happened. On the street, a blue minivan equipped with a car seat had crashed into a red Mercedes coupe. The driver was badly hurt. A short time later, Boston police officers surrounded the minivan, with guns drawn. 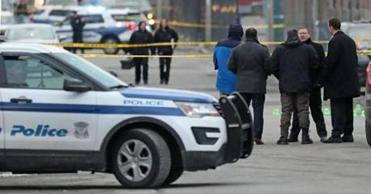 But the man, later identified by two law enforcement officials as Kasim Kahrim, 36, was dead. The officers had followed the minivan from Gerard Street, less than a quarter-mile away, where police allege the driver shot at two uniformed officers, wounding one of them. The officer, who was not identified, was shot several times in the upper torso and later underwent surgery and is expected to survive, officials said later Friday. 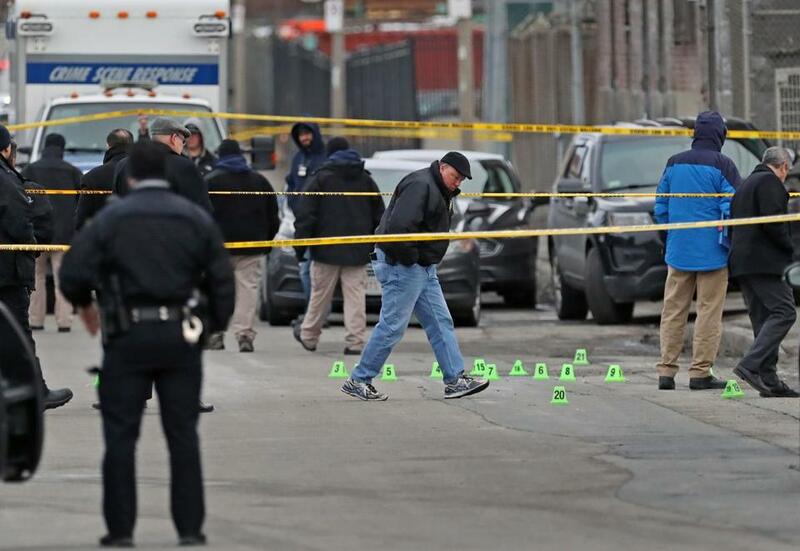 A Boston police officer was wounded and a male suspect was shot dead during a confrontation in Roxbury early Friday morning, Police Commissioner William Gross said. Kahrim, the man two officials identified as the minivan driver, had allegedly fired at the officers after they encountered his vehicle around 2:20 a.m., according to police. The officers returned fire, striking Kahrim, who drove away before crashing on George Street. Police said they found a gun inside the minivan. Police did not explain what brought officers in contact with Kahrim or provide details about the gunfight, saying the investigation was ongoing. Kahrim had been released from MCI-Shirley less than three months ago, on Dec. 7, after he pleaded guilty to carrying a firearm without a license, according to court records and the state Department of Correction. Police arrested him for that offense in March 2016 after Kahrim fired a gun in the presence of an 88-year-old woman on Harlow Street in Dorchester, where Kahrim’s family owns a condominium, records show. Since at least 2001, Kahrim has been in and out of prison or jail for a range of criminal convictions for offenses such as stalking in violation of a restraining order, carjacking, and violating probation, court records show. On George Street, a man described watching police close in on Kahrim’s minivan after the crash. At an early-morning news conference Friday at Boston Medical Center, Boston police Commissioner William Gross said Kahrim “exchanged several rounds of gunfire, with the Boston police officers, resulting in an officer [being] shot several times.” He didn’t identify Kahrim by name. The officers have been on the force for one or two years, Gross said. They are assigned to the South Boston station. The conversations between dispatchers and the officers on the scene were posted on the Broadcastify website. One of the officers can be heard calling out the description of the minivan, its license plate number, and the direction it was heading. “Which way did he go?” an officer asked. “101, do you have that car stopped?’’ the dispatcher asked. “He took off on us,’’ the officer on the scene reported. In a statement, Suffolk District Attorney Rachael Rollins said her office will conduct a “full, fair, thorough, and impartial” investigation into the shooting, as required by law. She said she was relieved the wounded officer will survive and extended her hopes for a full recovery to his family and fellow officers. Anyone with information about the incident is urged to come forward, Gross and Rollins said. On Harlow Street, people gathered at Kahrim’s home declined to comment. The same year, James Hills, an antiviolence activist, wrote a letter supporting Kahrim, describing him as “polite and articulate.” On Friday, Hills said he was stunned that Kahrim was killed in an encounter with police. While jailed in Norfolk County in 2013, Kahrim completed a substance abuse treatment program, a men’s health course, and parenting classes. Abbi Matheson, Kathy McCabe, Mike Bello, John R. Ellement, and Travis Andersen of the Globe staff contributed to this report. Emily Sweeney can be reached at esweeney@globe.com. Follow her on Twitter @emilysweeney. Laura Crimaldi can be reached at laura.crimaldi@globe.com. Follow her on Twitter @lauracrimaldi.